Spyshots of Peugeot’s new SUV developed together with Mitsubishi with the Mitsubishi Outlander platform have been floating around since early this year, and today PSA Peugeot Citroen has announced the new Peugeot 4007 SUV together with its Citroen C-Crosser twin brother. Though it is on Mitsubishi Outlander underpinings, the new SUV looks nothing like it’s roots – it was styled at Peugeot’s design center in France, and keeps the same feline design language as the other cars in it’s family. 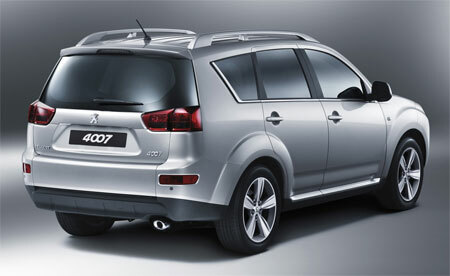 While the flagship Outlander is powered by a 2.4 litre Mitsubishi MIVEC engine, Peugeot’s offering is spearheaded by a 2.2 litre turbodiesel with a Diesel Particulate Filter System. The common rail direct injection turbodiesel makes 156 bhp and 380Nm of torque, and is biodiesel ready. Biodiesel fuel up to a 30% mixture can be used without any modification to the engine. Standard transmission is a 6-speed stick shift. One additional photo after the jump. 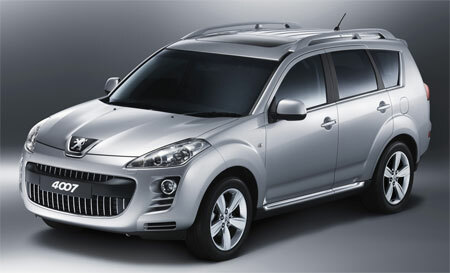 The new 2007 Peugeot 4007 will go on sale in the second half of 2007.